There are few greater joys in life for this beauty addict than the marriage of two of my greatest loves: Shu Uemura and heat styling. What more could a girl ask for? 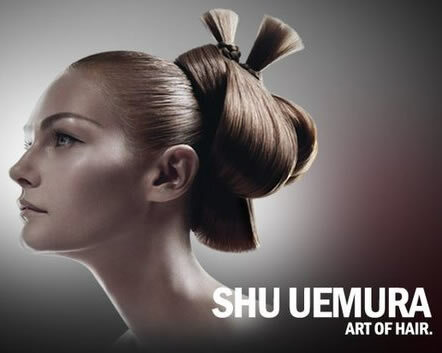 Shu Uemura debuted the Art of Hair line this year, and included in the collection is the Satin Design White Tea Polishing Milk, a versatile leave-in meant to finish blow dried hair. Since I just got a brand new hair dryer, I was excited to try the product with a fresh blow drying. The product comes in a pump top bottle with Shu Uemura’s signature contemporary black and white design. Simply pump a small amount into your hands and distribute evenly through towel-dried hair before blow-drying, or on dry hair for finishing touches. I use the first option, since my light red hair can look a little cloudy when I put in product while it’s dry. The polishing milk itself is a creamy, white (surprise!) substance that flows seamlessly into hair. After I dried my hair, I could really feel the difference this product made. My hair was shiny, full of body and felt softer than ever! And here’s what really threw me: my hair was so thick and smooth, my ponytail holder kept creeping down. Best of all, the effect lasts all day, even weathering 114-degree desert heat and dryness. All in all, I’m very impressed. This product gave me every quality I’ve ever wanted in my hair. The verdict: 10/10! If this is the art of hair, color me an avid collector of Shu Uemura’s work from now on. Shu Uemura The Art of Hair Satin Design White Tea Polishing Milk is available at Shu Uemura’s stores and select salons nationwide. I HAVE to get this now. I didn’t even know Shu Uemura made hair products. I thought it was all makeup. I had only heard of the eyelash curler because of the Devil Wears Prada. Awesome thank you! !